PlayNGo’s Chinese-themed online video slot Chinese New Year celebrates Chinese culture and gives players the chance to win a top fixed prize of 5,000 coins. The slot is packed with lucrative features such as free games, a multiplier value of up to x5, and a bonus game with a prize of up to x150. 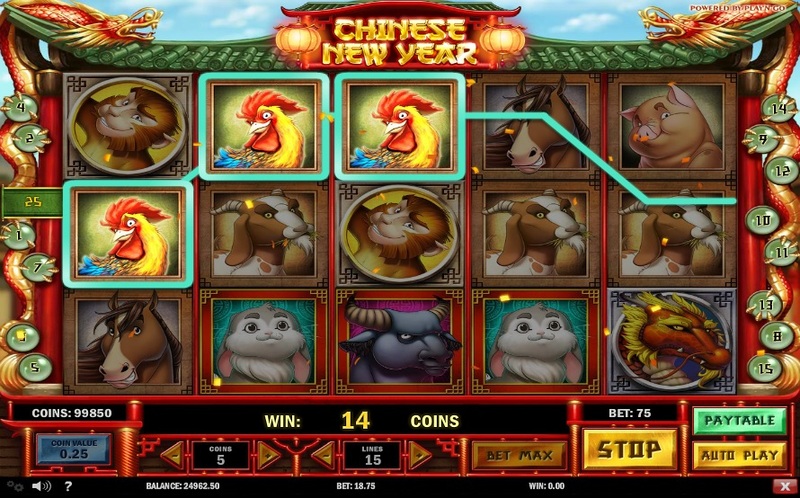 Chinese New Year is based on standard slots rules, which makes it easy and fun to play. The slot comes with 15 paylines, and to start playing, players must select the number of lines they would like to play. Players can then bet up to 5 coins for every line activated, selecting from coin values that range from $0.01 to $0.25. This means that players can bet up to $18.75 per spin of the reels, which makes it a popular slot among low rollers. The slot has an Autoplay feature for players who do not want to spin the reels manually. As its title suggests, Chinese New Year celebrates the Chinese New Year in the grandest way possible. As players spin the reels, a charming track plays in the background. The reels are packed with colorful symbols of animals that have a lot of significance in Chinese culture. While spinning the reels, players can interact with snakes, oxen, dogs, pigs, horses, rats, and goats. Players will find that playing this slot is an absorbing experience indeed. The Tiger symbol serves as the wild, substituting for all other symbols except the bonus and scatter symbols and helping players create winning combinations. If players land a combination of five Tiger symbols along an active line, they can take home the top fixed jackpot of 5,000 coins. Chinese New Year delights players with not one, but two bonus features. The Fireworks Bonus Feature is activated by the appearance of three Dragon symbols on the third, fourth, or fifth reels. The slot challenges players to light fireworks, which reveal attractive cash prizes of up to 150 coins when they explode in the sky. If players land three Monkey scatter symbols on the first, second, and third reels, the free spins round gets activated. Players will then receive up to 15 free games with a multiplier value of x5. The number of free games players will receive depends entirely on a mischievous monkey who plays a lucky wheel for them. The free spins round includes an extra scatter symbol in the form of the Pig. Playing Chinese New Year is an entertaining way to learn more about Chinese culture and lifestyle. The slot owes its popularity not only for its charming theme, but also for lucrative features such as free spins, bonus games, and multipliers. The slot is available at any casino that offers PlayNGo games.